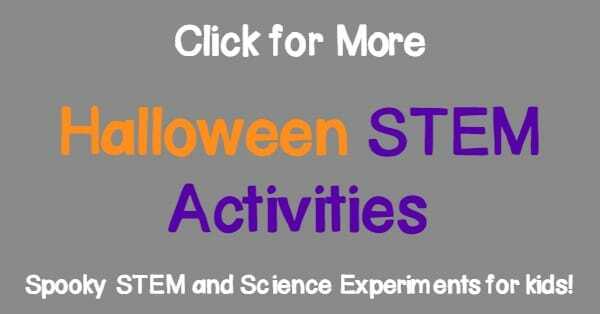 Halloween STEM activities are the best way to celebrate the holiday as far as we’re concerned. 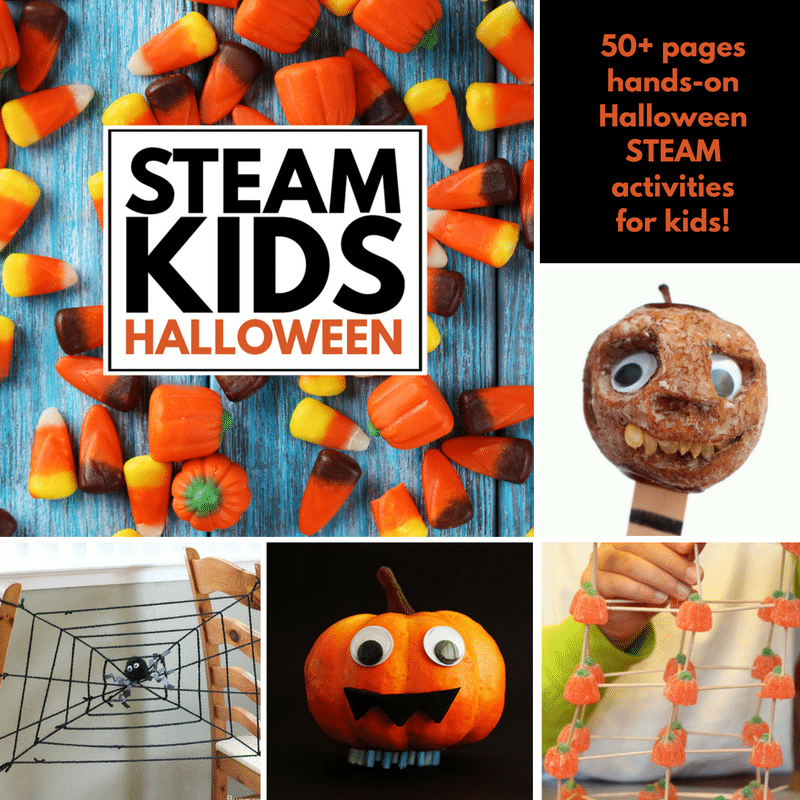 But did you know that there are scientific principles behind common Halloween decorations? These worms are popular because they are jiggly, gross, and delicious, which make them perfect for any Halloween party. But there is also quite a bit of science behind how gelatin transforms into a semi-solid when cooled. 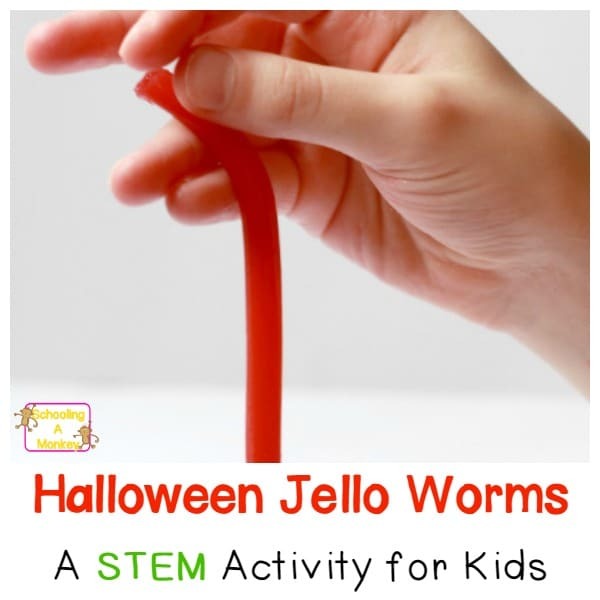 After making your Halloween jello worms, take a minute to discuss the science of gelatin with your kids. If you have always wanted to make Halloween jello worms but never have, once you find out the science behind the experiment, you’ll just HAVE to make it! 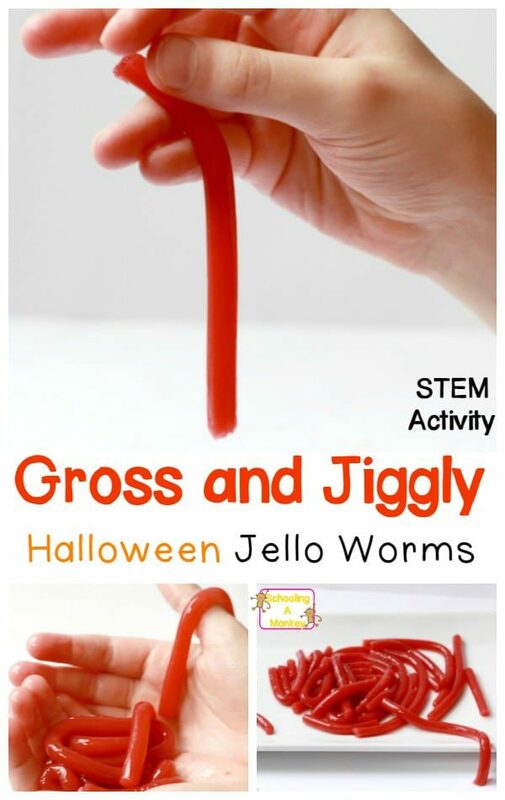 Use these simple worms to make your own Halloween jello worms like a mad scientist! We kept our recipe super simple. We dumped the water, flavored gelatin, milk, and food coloring all together in one pot. We chose the combination of grape and red food coloring to get realistic-looking worms. In real life, these worms are slightly more clay color than the bright red they look here. Heat the mixture until it just boils. Add the unflavored gelatin slowly while stirring to prevent any lumps from forming. Cool the mixture in the fridge for 20 minutes. 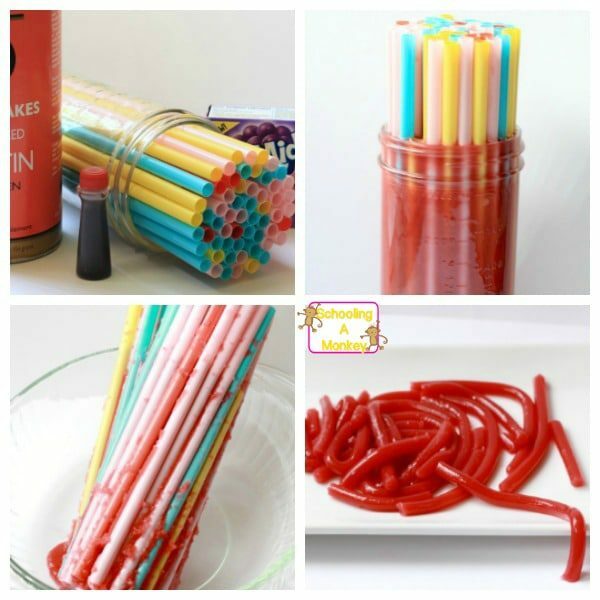 While the mixture is cooling, fill your jar with straws. When the mixture is cool, poor it into the straws. For some reason, it doesn’t matter if you actually fill the straws. They fill from the bottom up. Place your jar in the fridge for 24 hours. Run hot water over the bottom of the jar to loosen the gelatin. If it is stubborn (ours was), run a knife around the edge to encourage the gelatin to release. Place the giant straw bundle in a bowl. Pull apart the straws. Remove the jello from between the straws and use it to make the jello brain recipe. Pick up one of the straws and run it under hot water. You’ll know it’s ready when the worm starts to peek out of the bottom of the straw. Squeeze the end of the straw and gently push the worm out of the straw from the top to the bottom. If your straw was appropriately heated, it will slide right out without breaking. But, if it was not heated enough, it will squish as you press the straw and break into pieces. So, make sure you aren’t impatient. 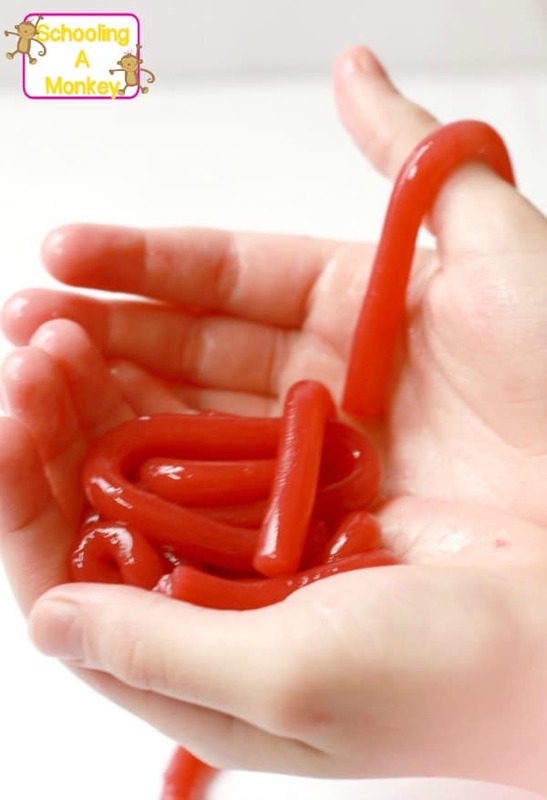 Once de-strawed, place your jello worms into a bowl and enjoy your gross dessert while discussing how collagen fibers work. 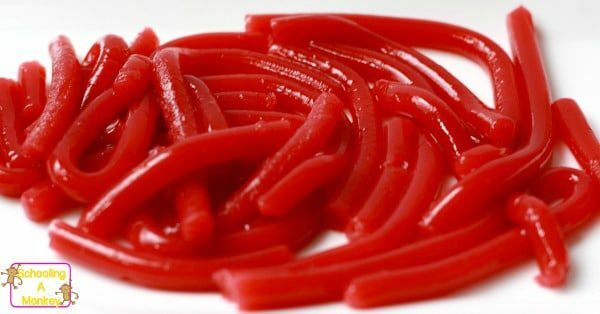 Jello worms are hardened using gelatin. Gelatin is made from collagen, which is a component of animal connective tissue. When gelatin is heated, it dissolves into the surrounding liquid because collagen fibers are relatively weak. But when the mixture cools, it tries to find the bonds contained in the original helical structure of collagen. This forms into a gel. The gel is considered a viscoelastic material with some solid properties. This makes it ideal for mimicking the attributes of a wiggly, slimy worm.